Gold futures settled modestly lower for a third straight session on Monday, while silver climbed higher for a second session in a row and closed near a two-year high. Gold for August delivery shed $1.80, or 0.1%, to settle at $1,356.60 an ounce on the Comex division of the New York Mercantile Exchange. "This is more of a risk-on day. The Brexit issue seems to be downplayed a little bit. A new prime minister’s been selected, so things are a little bit better," Reuters quoted Bill O’Neill, co-founder of LOGIC Advisors. Gold futures ranged from a low of $1,351.80 to a high of $1,376.50. The yellow metal advanced last week by 1.5%, recording a sixth straight weekly gain. Rising for the eighth time in nine sessions, silver for September delivery settled up 20.5 cents, or 1%, to $20.304 an ounce. The close is the highest since Aug. 1, 2014 when the precious metal ended at $20.37 an ounce. Silver futures traded between $20.17 and $20.76. Last week, they rose 2.6%. October platinum added $7.90, or 0.7%, to $1,108.10 an ounce, ranging from $1,093.30 to $1,109.50. Palladium for September delivery added $8.65, or 1.4%, to $625.75 an ounce, trading between $615.60 and $627.60. Gains for each metal last week totaled 4.1% and 1.9%. Gold moved up $2.85, or 0.2%, to $1,357.10 an ounce. Silver moved up 75 cents, or 3.8%, to $20.47 an ounce. Last week, London bullion prices advanced by 1.1% for gold, 2.5% for silver, 4.1% for platinum and 8% for palladium. Earlier in the day, the U.S. Mint said its latest weekly allocation of American Silver Eagles is 3,649,500 coins. While their sales have slowed in recent weeks, 2016 Silver Eagles are still tracking toward an annual record with 26,675,500 sold. The figure represents an 8.9% increase over those sold through same time in record-breaking year 2015. Not a single 5-ounce silver billion ATB puck has been sold in more than a month! The Mint’s supply of silver American Eagle bullion coins is sufficient at more than 3.6 million coins that it can stop saying they are being “allocated” or “rationed”, especially since the Mint’s 13 worldwide bullion coin Authorized Purchasers haven’t purchased anywhere near the amount available for many weeks in the past two months. Supply is available, but demand is not there for these common bullion coins. I agree. So why are people (though) still buying the ASE bullion? I don’t. If I want silver I buy bars, that’s it. I cannot understand the fascination. It’s a nice looking coin, don’t get me wrong, but…. In fact right now I’m not “buying” at all. I too have never understood the popularity of the ASE bullion version coins. As a matter of fact, they are only .9993 fine silver & don’t have the extra anti-counterfeiting elements that the .9999 fine silver Maple leaf bullion coins of Canada have. I buy some bullion coins just for the design (one of each design) , but for investment I buy silver bars & ingots with a lower premium over spot. The difference is that if the price of silver ever gets up there, there is going to be counterfeiting. 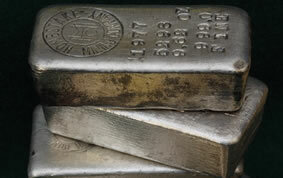 A silver bar or round is ridiculously easy to counterfeit. Just a bunch of words stamped on a piece of metal. ASE bullion at least has a design that is a little hard to copy well and perhaps easier to detect. The Mint needs to incorporate stronger anti counterfeiting measures as the Canadian Mint has done. There are already counterfeits of the ASE coins, including Proofs in very close to real counterfeit NGC holders made in China. They appeared earlier this year at large coin shows in Ohio & Florida. In any case, I only buy (from a dealership I have bought from since 1979) the top bullion brand bars & ingots made by Royal Canadian Mint, J&M & Sunshine Mining & Minting Company which supplies the US Mint with the silver ASE blank planchets. Counterfeits are everywhere & you have to educate yourself about them to protect your investments.